Well, I'm very relieved to say that I managed to complete June's project - unlike the one I chose myself (lol!) for May. Let's just say that is still a 'work in progress'. I have thoroughly enjoyed making my flag book so thanks a lot Elaine for choosing it. 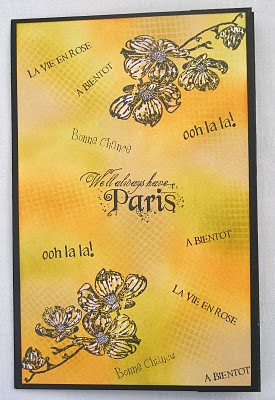 I hope you won't be bored as I also used the beautiful Paris stamps from Elusive Images as Jo did. I mixed mine with another Paris set and for the life of me, I can't remember whose they are. I'm hoping Jo's wonderful memory serves me well (as she was with me when I bought them) and that she'll be able to add the name ................... here! I also chose the Paris stamps because I needed so many on the same theme to be able to stamp 18 flag sides and I suppose it was inevitable that at some point two of us were going to choose the same stamps for a project. I hope you don't mind a lot of photos because this project warrants them I think. I also had an accident with one of my Distress Inks. I decided my inkpad needed re-inking but although I was using Old Paper I was thinking Tea Dye and I re-inked with the wrong colour. 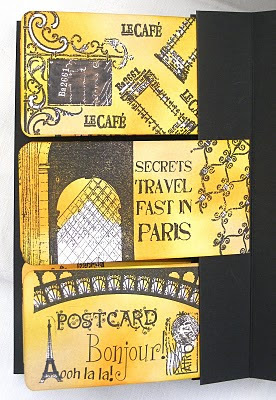 I now have an interesting new Distress Ink colour, lol, and had to use a different DI for my trio of colours which were Wild Honey, Crushed Olive and Tea Dye. I also had one major moment of panic. Because the second set of stamps I used were clear stamps I didn't want to use Stazon for stamping the images so I decided to go with Ranger Archival Black. Then when I came to paint them with bleach I suddenly thought Uh! Oh! is the bleach going to remove the black image? I had also taken note of Willy's advice that some of the DI colours react differently to the bleach so I stamped an image and put some patches of the three colours onto some scrap card and 'painted' them to check them out before I risked ruining my carefully stamped flags. Yipee, all three colours disappeared beautifully and the Archival Black stayed put! Finally, another look at the front cover so that you can see the details a little better. I'd like to say a big thankyou to Willy for her inspirational article in June's Craft Stamper magazine. It's been a brilliant project to do and I will definitely be using the painting with bleach technique again. Hope you enjoyed your visit and many thanks for any comments you have time to leave. 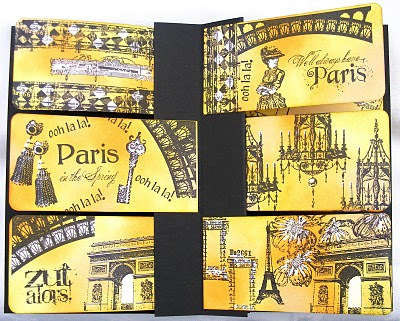 I am blown away Lesley, this is stunning! 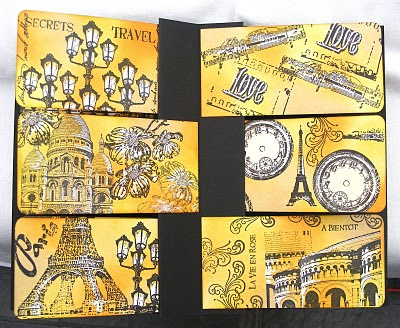 Stunning work - love everything about it and hey, you created a new Distress Ink colour - great idea, even if it was accidental! Well this certainly warrants all those photos Lesley. It truly is superb. I love the colours and the bleaching and those stamps are gorgeous. What a work of art. 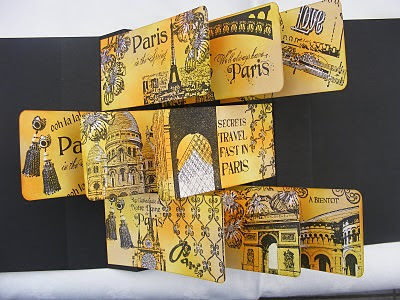 Lesley, this is another gorgeous project - it so easy to see how much you enjoyed making this. 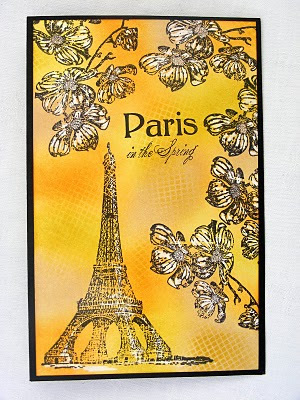 The colours are so warm, and even though you and Jo have both used the Paris stamps you have both really stamped your own individuality on your projects. I love the colours, they are so warm - it glows. The bleaching has worked really well, I must do a test run on mine as I have used Adirondacks and as you know I have plenty to experiment on given my water damaged flags!! 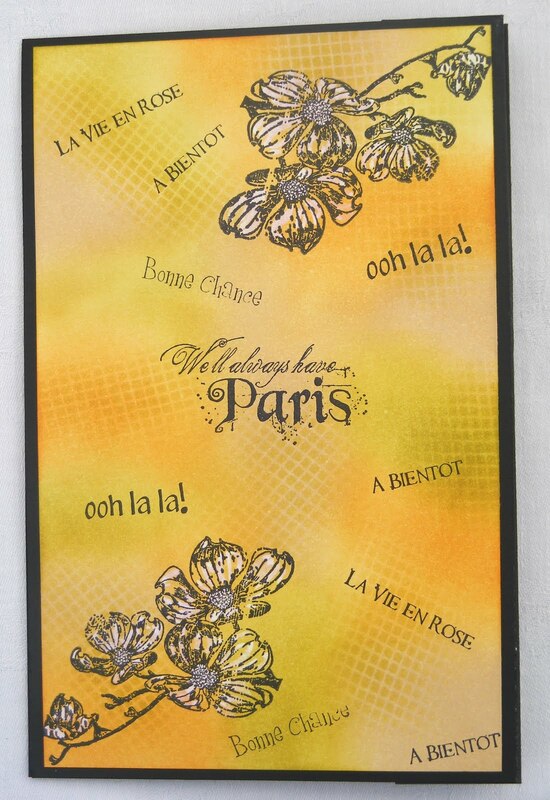 Ooooh Lesley, you know how much I love those PRIMA stamps!!! Gorgeous colouring here and your bleaching is really effective. I think we have our twinning thing going on again. I even made the same mistake of stamping on my flags before deciding which side wouldn't show right to the edge. 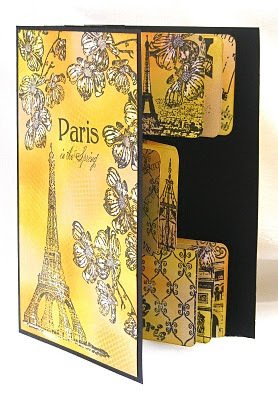 Your tower is perfect for the cover and the flowers look like they were made for this project too. Glad you had fun making it. Oh la laa... stunning! Inspirational! love it. Wow - stunning - I'm blown away. Just love the colours and the way you have put everything together so that it flows really well. Lovely work, Lesley and such alot of it! The bleaching technique is so effective and I am so glad it worked out well. The colours you have used work very well. A marathon task that is very impressive. 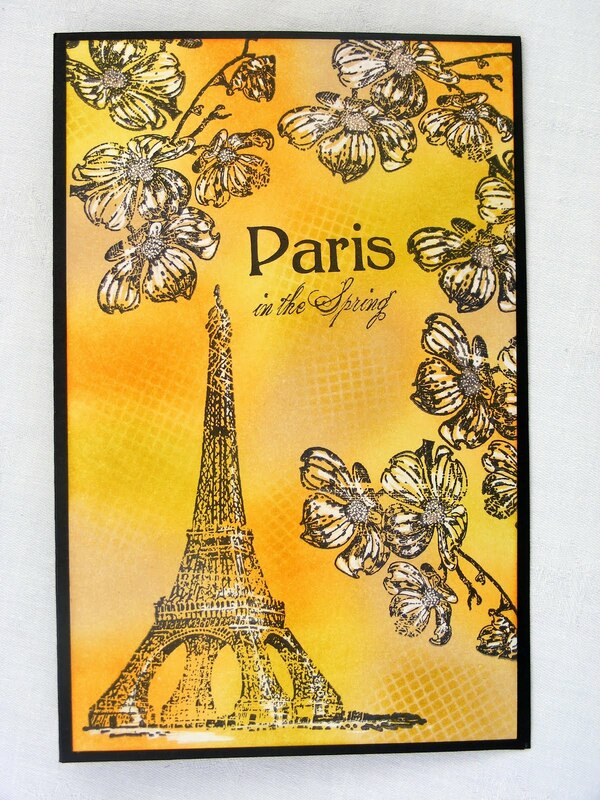 WOW Lesley this really is Paris in the Springtime. I love it!! Absolutely stunning - just love the colours you have chosen to work in.